Following a drastic turn and sharp descent, the pilot announced that an emergency landing was necessary. The slight quiver in his voice betrayed his attempt at nonchalance. 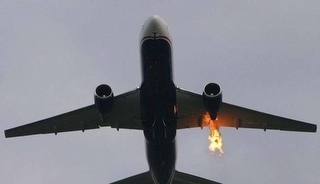 Just a few minutes earlier, the co-pilot had awkwardly informed us that the right engine was on fire. They shut down the faulty one. He assured the cabin that they were trained and able to fly an aircraft with a single engine. I had chosen this airline to save a few dollars. It was a new airline with young pilots and an even younger crew. I was seated in seat 1C on a short night-time flight from Toronto to Ottawa before connecting to another flight that would take me home to my pretty wife and fun-loving kids. Having the closest seat to the cockpit gave me a front-row view of the commotion. The pilot instructed the crew to take their seats in preparation for “landing.” A young attendant took her spot in the jump-seat facing me. Our knees were about four feet apart, leaving little choice but for us to engage in an uncomfortable chitchat. At my best, I’m silly and sarcastic. At my worst, well, I’m just plain awkward. “Are you okay, sir?” she dutifully asked. She added a nervous smirk. She didn’t laugh. I fumbled with a magazine. My seatmate started crying. In case you are wondering, we did not crash and I did not die. We landed with a vicious thud and an abrupt stop. Emergency vehicles rushed to the aircraft. After a few minutes, we were dispensed like livestock back into the Toronto terminal, and a few hours later I was on another aircraft heading home. I need my surgeon to have diplomas and certificates hung on his office wall, but before he cuts me open I want to know that he has sliced a few dozen people already—and with a high rate of success. I want my chiropractor to have done more than watch a few YouTube training clips. I want those who are responsible for the ones I love to have cultivated some instinct and intuition. They have to bring to the table more than their education. There is a difference between “education” and “training.” In leadership preparation, we may have over-promoted education. Leadership cannot be taught. It is a God-given talent. Skills can be taught, but leadership is not a skill. Nor is it a science. It is an art. It comes from within. In the ministry context, leadership is empowered by a supernatural force that reaches beyond education. The natural talent of leadership can only be enhanced. Skills and tools can be added. We cannot make leaders, but we can make leaders become better. This is why leadership giftings (and callings) can transcend all personality types, self-esteem, upbringing, and dysfunction. It is also the reason why insecure people can still grow as leaders, regardless of their concept of self. Insecure leaders must learn that when they say it is impossible for them to do what God has asked, it is less a statement about their weakness and more a testimony about their lack of faith in God. Your path to leadership has made you into the leader you are, and the effects of that journey are often the same things that empower and validate your leadership. Ability is the gift of experience, as is intuition, wisdom, knowledge, and confidence. These, therefore, are like gold and should never be squandered. The blessings you have received are always for you to share with others. Likewise, the curses and crosses you have borne are for you to share as well—in the form of warning signs for others. If one’s path into leadership is void of obstacles, chances are that the path didn’t lead anywhere significant. Without challenges, the reward of arriving at the destination isn’t as sweet. It is precisely these paths which create meaningful leadership. Indeed, there is a deep modern-day thirst for gripping and innovative leadership. People are pleading for leaders who will inspire them to go places they would never go alone and to attempt things they would normally consider unattainable. They want someone who will give them the opportunity to end up somewhere on purpose. The problem is that none of us are born with the leadership skills we need to help guide those who follow our lead. Our theological institutions have done well with aligning our theology, but they have failed to enhance us as leaders. We are left with a propensity to replicate the poor leadership habits of others, especially when spiritual models and mentors are not easily found. The root of this crisis is neither cognitive nor academic. It is not church malfunction. It is not institutional apathy. The problem is spiritual, psychological, and yes, in some part theological. Simply, we are scared. I doubt there has ever been an era when leaders have been more timid about who they are or what they are aiming for. Bill Thrall says, “The dysfunctions of many leaders are rooted in a common reality: Their capacities have been extensively trained while their character has been merely presumed.” This assumption cultivates and nourishes insecurity. 1. Their conversations center on themselves. 2. They enjoy telling others of their busyness and obligations. 3. Attendance patterns, finances, and the sum of church programs mean more to these church leaders than transformed lives. 4. They have the need to maintain control and they struggle with permitting others to lead, especially if the others lead well or lead better than they do. 5. They feel threatened, jealous, or angry, and display a need to brag or become sarcastic when in the company of a proficient leader. 6. They feel vulnerable when a subordinate outperforms them. 7. They are reluctant to give credit for victories and struggle to celebrate someone else’s achievements. 8. They get annoyed when people do not call them by their title. 9. They default to leading by consensus (what people think) rather than in consultation with God. These attributes cause us to try to master the “how-to’s” rather than being a called child of God or the “why.” In The Call, Os Guinness describes the calling as “the truth that God calls us to himself so decisively that everything we are, everything we do, and everything we have is invested with a special devotion and dynamism lived out as a response to his summons and service.” However, we are now reducing ourselves to becoming ministry technicians. In the journey toward inner health, insecurity is not defeated by becoming surer about our leadership but rather by being absolutely sure about God. I have either been under the leadership, or been a leader who, has committed all of those mistakes at one time or another. As someone with experience with, christian youth leadership as well as secular youth leadership i have really seen what fear of losing control can do to a leader and those they lead. its devastating to the vision of the team. In the teaching world the emphasis is always on management rather than leadership. we focus on doing things right, by the book, with no deviations. Expectations are the same across the board. When someone steps out of this line, regardless of the possible benefits someone else feathers get ruffled. Innovators and risk takers are stifled in favor of the safe, by the book methods. I have seen this a lot in the church as well. I have stifled people because i thought my way was the best or because i thought letting them try something would take away from my leadership. I have also been stifled. Focusing on the vision has been a great way to become a better leader. If I weigh every decision based on that vision (eg, developing teens into leaders, developing teens reltionship with God, developing techinical writing skills etc.) not only does the program get better at meeting the goals but more people can be involved, there is less work for me to do and my position of leadership is actually strengthened.